Hormel sees potential new customers for its shelf-stable foods: cancer patients. The company known for Dinty Moore stews and Spam canned meats is promoting microwavable meals it says cater to people who are going through chemotherapy and are sensitive to certain tastes. 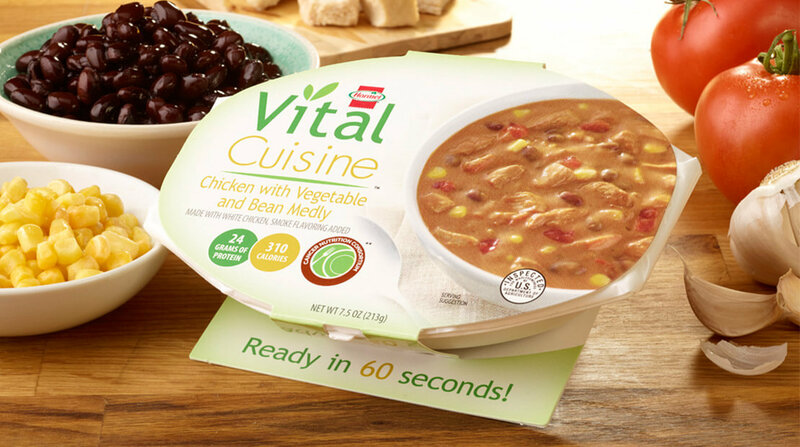 Its Vital Cuisine meals, launched last year, are also marketed as delivering the nutrients and convenience people might want if they’re too exhausted to cook or leave the house for food. Whether they catch on remains to be seen. If loss of appetite is a problem, microwavable meals like stew that look similar to Hormel’s other products may not do the trick. Some may prefer ordering in from a restaurant or other microwavable meals they feel are tastier and just as nutritious. Still, it’s a chance for Hormel to build its business with hospitals and nursing homes, as well as selling such products directly to consumers. The company already offers “Thick & Easy” foods that have been pureed for the elderly and others who have trouble swallowing. To make them more appealing, some purees are molded back into the shape of foods like scrambled eggs. Here’s what Don Kremin, who heads Hormel’s specialty foods group, had to say about Vital Cuisine.